"The all-new Walter. Created to serve." 20th Century Fox has revealed a brand new promo video for Alien: Covenant, introducing the newest version of the android made by Weyland-Yutani. The term used by the company is "synthetic", and the character is again played by Michael Fassbender. In Prometheus, he was called David, but in this movie he's known as Walter - so this video is all about meeting Walter. 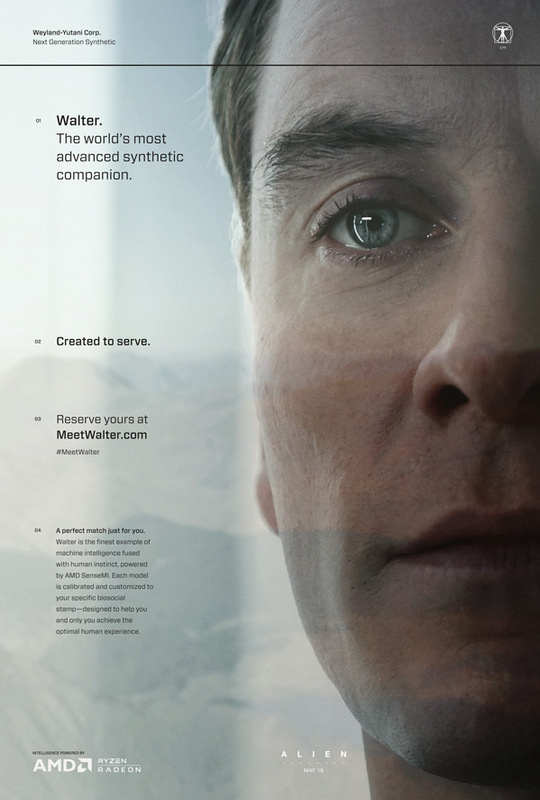 "Walter is the world's most advanced synthetic companion, designed to help you achieve a better human experience. Each model is individually calibrated to serve its owner's unique set of needs and preferences." There's a new website as well to custom build your own Walter. I like this marketing - it connects back to Prometheus and the marketing for David (and the TED Talk) and it's a a very clever world-building concept. See below.